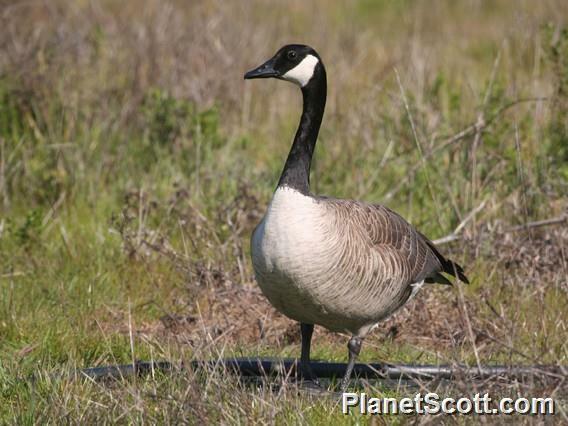 This goose feeds on aquatic vegetation and grasses. It has become an agricultural pest in some areas where it moves from water bodies to fields in order to feed (3). Although often aggressive, this goose is gregarious, occurring in flocks during winter and breeding colonially on larger water bodies (5). The nest, a down-lined scrape, is typically situated among vegetation (5). During early April between 5 and 6 (up to 11) white eggs are laid. The female incubates the eggs for 28-30 days, while the male guards the nest close-by (5). Both sexes care for the young, which fledge after around 9 weeks, and stay with the parents throughout the winter (5). Sometimes found in the parking lots to the north of the stadium. Large numbers of Canada Goose were in the area. In quarry near the entrance.